Tiffany Cheung hightailed it out of the small town of Everville, New York as soon as she had the opportunity. For years, she’s been trying to make a name for herself in publishing, attempting to put her English degree to good use in Manhattan. But when she loses her job and can’t pay the rent on her apartment, her only option is to move back in with her parents. Her family is embarrassed by the way Tiffany’s career has worked out, but they’re delighted that she’s available to help out at the family diner. Tiffany is not so pleased at this prospect, and when the opportunity arises to tutor her high school crush’s son in English, she immediately accepts. Tiffany hadn’t realised that Chris Jamieson had returned to Everville, let alone that he’d dropped out of college when his girlfriend got pregnant. Now Chris is a divorced, single-parent attempting to make his dad’s farm into a profitable business venture. Chris doesn’t want to project his lost dreams on to his son, but he can’t help but wish Simon would make of his life than he did. Tiffany tutored Chris in high school, and he hopes that she’ll help Simon make his way through summer school unscathed. What neither of them expects is for the spark Tiffany and Chris had in high school to be reappear, especially considering that Tiffany has no plans to stay in Everville permanently. Given that Chris is tied to his farm, is there any hope for their romance to last beyond this summer? 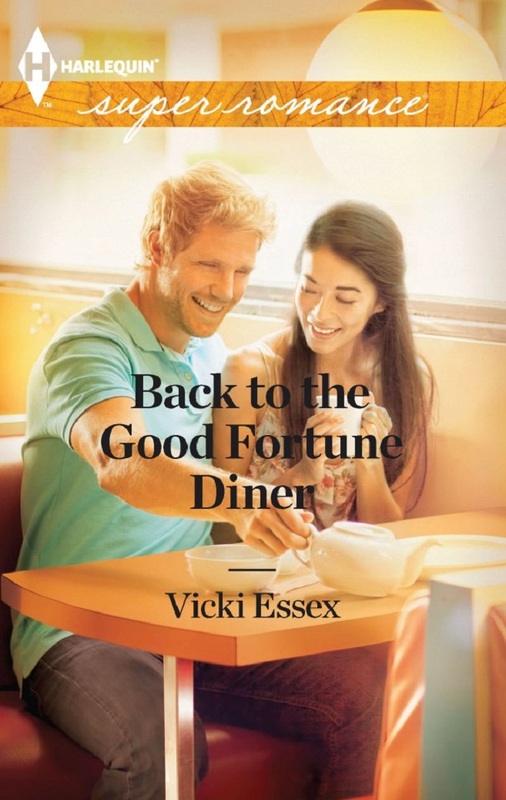 Back to the Good Fortune Diner immediately grabbed my attention when I was flipping through the publisher’s catalogue, even though I’ve only dabbled in the Superromance line once before. It might not be obvious from my profile picture, but I’m Anglo-Indian, and I’m always pleased to come across a mixed-race heroine in the romance genre. The fact that Tiffany was Asian-American was enough to inspire me to read this book, and it helped that I’m a big fan of small-town stories and reunion romances. Tiffany is actually the second Asian-American heroine I’ve encountered this year, since I read Camy Tang’s Sushi for One? back in January. Both novels featured single women nearing the age of thirty and struggling with their families’ projections for their futures. I have to say that I related to Tiffany more so than Lex, the protagonist of Sushi for One? Admittedly, I didn’t think I’d have a lot in common with either woman, given that I got married at the age of twenty and that my Indian family has managed to avoid pigeon-holing me into the traditional career route of doctor/lawyer/minister. But as Back to the Good Fortune Diner progressed, I realised that I had more in common with Tiffany than I initially thought, and I’m sure I won’t be the only reader who is pleasantly surprised by the message in this novel. Several reviewers have commented on the fact that Tiffany isn’t always the most likeable heroine, and I commend Vicki Essex for taking this risk. Even if I disagreed with some of Tiffany’s actions, I didn’t want to shake her for making such silly decisions because I could understand her reasoning. Tiffany is scared of taking risks, and constantly has her defences up, a throwback to the bullying she experienced as a child. Although the bullying I experienced at school wasn’t linked to my ethnicity (given that my skin is more akin to that of a vampire than my Indian grandfather) I, too, would be shocked if someone who had looked down on me at school suddenly wanted to go on a coffee date. Sometimes it’s hard to reconcile our past memories of a person or a place with the present-day reality, so I didn’t blame Tiffany for the way she acted at certain points throughout the novel. I’m sure that anyone who has had trouble fitting in—whether for issues of race or not—will be able to relate to Tiffany’s problems in Everville. Despite their different racial backgrounds, Tiffany and Chris’s families have a lot in common, mainly their constant projecting of ideas about their children’s futures. This is something I’m so, so thankful that I never experienced, but I didn’t stop me from sympathising with Tiffany and her brother, Daniel, or Chris and his son, Simon. I appreciated that Vicki showed that parents having visions of their children’s futures isn’t limited to any specific ethnic group, and your race doesn’t determine how you deal with parental pressure. Tiffany and Daniel had very different responses, with Tiffany running away to Manhattan and Daniel attempting to align his life to his parents’ vision. On the other hand, both Chris and Simon get defensive about their respective parents pushing them towards a certain future, which causes a lot of tension in their family. I hadn’t realised that the Superromance novels contained sub-plots, so Daniel’s story was a pleasant surprise. It did take me a while to warm up to Daniel and his dilemma over introducing his non-Asian girlfriend to his family, and admitting to them that he might not want to run the family business when his father retired. Initially I didn’t care much about Daniel and just wanted to get back to Tiffany’s story, but he grew on me as the novel developed. I realise that I’ve not actually discussed much about the romance yet, which might seem odd given that this is a romance novel. The theme of fitting-in and Tiffany and Chris’s character growth is tied tightly to their romance, with all of the elements depending on each other in order for their relationship to survive. I suppose you could say that their romance is typical of small-town stories where one character returns and discovers that the sparks are still there despite not having seen each other in years. Personally, I like those sorts of romances, and I appreciated that what was keeping Chris and Tiffany from admitting that they wanted their relationship to last was actually their own fears and misconceptions about the future. This was wrapped up in what I felt was the major theme of the novel—Do you really know what you want? Sometimes we think something is the best path for us in life because it makes the most money, or because it fulfils our parents’ dreams for us, or because it validates our university or career choices. Or sometimes it’s simply because it’s the safest route. I know I’ve been guilty of this lately, and it’s taken me a while to admit to friends and family that I want to devote the next few years of my life working on my writing, rather than getting further qualifications or taking a safe job. Tiffany and Chris’s fears really spoke to me, and I have a feeling that they’ll hit a chord with other readers as well. There isn’t a lot that I disliked about this novel, but if I had to pin-point anything, I had a couple of issues with the secondary characters. As I mentioned before, it took me a while to warm up to Daniel, but it was quite the opposite with Chris’s father, William. Regardless of how completely un-politically correct he might be, he seemed pretty realistic at the start of the novel. However, he had a complete turn-around later in the book when someone confronted him about his treatment of Tiffany, and I didn’t find it terribly believable, given how adamant he had been about his earlier beliefs. Perhaps if his change of character had been more drawn-out I would have bought it. I also wish that Simon’s conflict had been resolved more. He seemed a little forgotten in the rush to conclude Tiffany and Chris’s romance. My small issues with the secondary characters are honestly all I can criticise about this novel, which has been a wonderful introduction to the Harlequin Superromance line. If you like romances that feature dynamic characters, believable conflicts and appealing settings, this is definitely a line to check out, and I highly recommend starting with Back to the Good Fortune Diner. Disclaimer: This is a mass-market romance and contains three, brief sexual scenes, as well as a few instances of foul language. Review title provided by Harlequin.